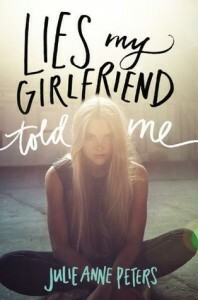 Lies My Girlfriend Told Me was an interesting novel. I wasn't completely sold on it, and I don't really know why. I know that I didn't like the dead girlfriend, Swanee. Seeing multiple people and lying to those people about seeing other people. Nope. Cannot do it. If you are eluding to exclusivity and seeing someone else behind their backs? That's called cheating, scum. I cannot handle cheating at all. And I also wasn't a huge fan of Alix's actions at the beginning. I mean ... pretending to be your dead girlfriend? That is all kinds of cruel, and totally unnecessary. If you wanted to know who this other girl was, you should have just asked to meet her, instead of torturing her. I thought Liana was adorable, and that Swanee's family were possibly the weirdest family I have ever read about (and completely conveniently absent throughout almost the entire novel).